I just disovered an interesting (and easy!) way to create digital student portfolios. 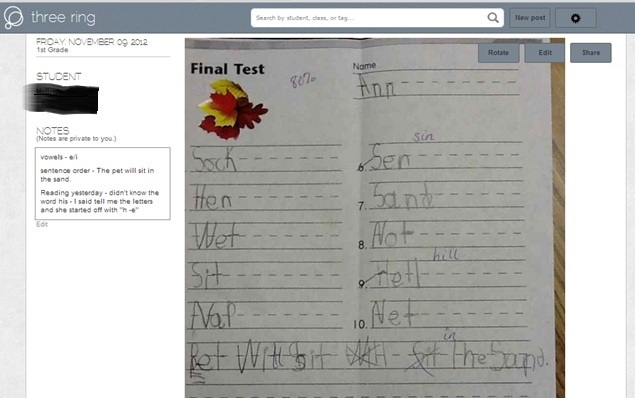 Threering.com is an application that allows you to capture student work (audio, picture or video) with your mobile device and save it to your threering account. They support droid and apple mobile devices. I have only used it a few times and it was super easy to setup and use. I was able to cut and paste a student list to setup the roster. I added a few of the subjects that are frequently assessed for the category tags by typing in the name of the subject. All of this was done through my desktop computer. I then took a picture of a student’s work with an ipad. I went back to the desktop application later that day and added in notes which are only visible to me. I still need to figure out how I could show the work (the image, etc.) without showing the notes. Parents and students can create accounts and you can choose to have the work (without notes) visible to them, so I may need to create a sample student or parent account so that I can show parents. Another user talked about taking a picture of student’s work and projecting it so that they could peer edit. This is a new product with even more features coming in the near future. It looks like a promising addition to the classroom and did I mention it’s FREE! You can check out a video about it at YouTube or sign-up for a free account at Threering.com. BTW, don’t worry about the name on this paper – that is her “Pilgrim” name! I’ll tell you more about our Pilgrim and Thanksgiving studies soon! Enjoy your long week-end! « Look Who’s Been Spotted in 1st Grade! Yeah! So glad you got it working! Thanks for following! Hey – so glad that you stopped over! Consider me a new follower!! I fixed my reply to comment issue. I just need to change my browser…whatever that means – just really means having tech savvy kids! I'm glad you found my post and hope it's helpful to you! I'm very excited about using this. I've been wanting to do something like this for awhile and haven't had the technology. It's here! BTW, I don't know this company personally at all. I sound like a spokesperson, but I am just an excited teacher! I love new technology!